Pat Buchanan is clearly in a huff regarding Ireland's successful marriage equality referendum as the former presidential candidate said during a WorldNetDaily interview that, "St. Patrick did not drive all the snakes out of Ireland," reports Right Wing Watch. 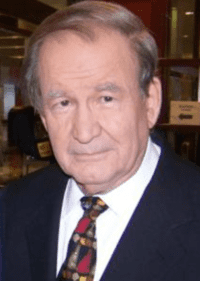 Buchanan blames the "death of faith" for bringing secularism, materialism and hedonism to Ireland and that society will ultimately perish because of it. "When the faith dies, the culture it produced begins to die, then the civilization goes, and, then, the population. As for the Catholic schools, I am sure that many of the priests, nuns and lay teachers are doing their best, but in the 21st century, the devil has all the best tunes. And, clearly, St. Patrick did not drive all the snakes out of Ireland." Buchanan's fear mongering could stand to "settle down," as John Oliver said of the Catholic Church's response to the marriage referendum.